The warm breeze brushed against my skin as I broke free of the doors of my nine to five job. My skin felt the warm sun beam down on it. A smile crept across my face. It finally felt like spring. The air smelled fresh and the daffodils were beginning to bloom. Spring is one of my favorite seasons. The world becomes green again and so many plants come back to life. It is like a fresh start to the year. Forget New Year’s resolutions. Instead, bring on the refreshing feelings of the flower sprouting season. On a warm day, such as today, there is nothing more that I crave than being outside and eating what I’ve deemed as “summer food,” which is anything that you would bring to a summer picnic or cook on the grill. I seized the opportunity to have Eric grill up some colorful marinated veggies, while I roasted sweet potatoes in the kitchen. I used Thomas’ Mexican vegan roasted potatoes recipe, which he posted on his blog, Don’t Switch Off the Light. The flavors of cumin and oregano paired so well together with the crispy sweet potatoes, that I was longing for more after they’d left my plate. 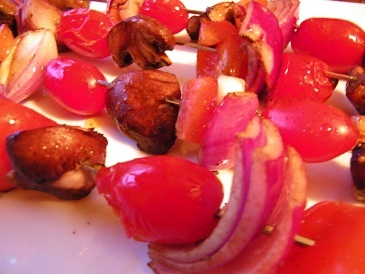 The skewers of portobello mushrooms, red bell peppers, chunks of red onion, and organic grape tomatoes, had a slight tangy flavor from the balsamic vinegar, which paired well with the sweet potatoes. 1- In a bowl, whisk together the vinegar, spices, and minced garlic. Then very slowly add in the olive oil as you continue to whisk the mixture. If you add the oil too fast, then the oil and vinegar will separate. 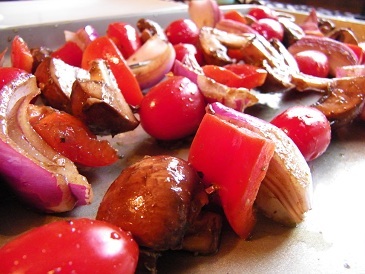 2- After making the balsamic marinade, dice the peppers, quarter or halve the mushrooms, and cut the red onions into thick pieces. Add all of the veggies into the marinade and let them sit in the fridge for at least a half hour. 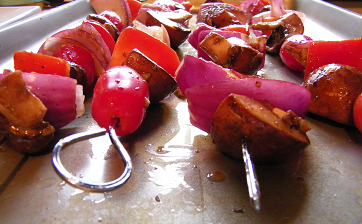 3- Slide the veggies onto metal skewers. Heat the grill to medium heat. Then, cook the vegetables until they’re tender, which should only take about 5-10 minutes. Take the skewers off the grill and serve! Who says grilling is only for meat eaters? Feel free to share any of your favorite vegetable based grill recipes. I loved grilled veggies! I haven’t made kabobs yet but I’m planning on it this summer. I usually just throw onions, bell peppers, mushrooms, and whatever else I have on the grill. I don’t normally marinate them, although I like to marinate mushrooms in a combination on Braggs, Worcestershire, and liquid smoke. The Kabobs would definitely make turning them much easier. Thank you! They are perfect for summer, don’t require use of a stove, and are simple. Win-win-win!